Some brands will do anything to make you think they are healthier for you including putting their product in a brown package or labeling it with an enticing buzz word. Would you believe that when I went to my health food store today I saw a package of refined white sugar labeled “Vegan!” Who do they think they’re kidding? Vegan is getting to be very popular, so why not say that sugar is “vegan.” It is true. Sugar did come from a plant. It was a plant a long, long time ago before it was mashed and stripped and chemically-treated and altered and granulated and bleached and who knows what else. What you choose to use instead of sugar can be a difficult decision because it depends on how far you are willing to go to protect your health and how far you personally should go to improve any conditions you currently have that are sugar-related or sugar-aggravated. My mantra is always the same: pick the closest thing to whole food as possible. I don’t actually know of any sweetener that is a complete whole food. All of them, even the best choices, are processed and refined to some degree. Probably some of you might say 100% raw honey right out of the honeycomb is an unrefined, whole sweetener. And I’d have to agree with you on that. 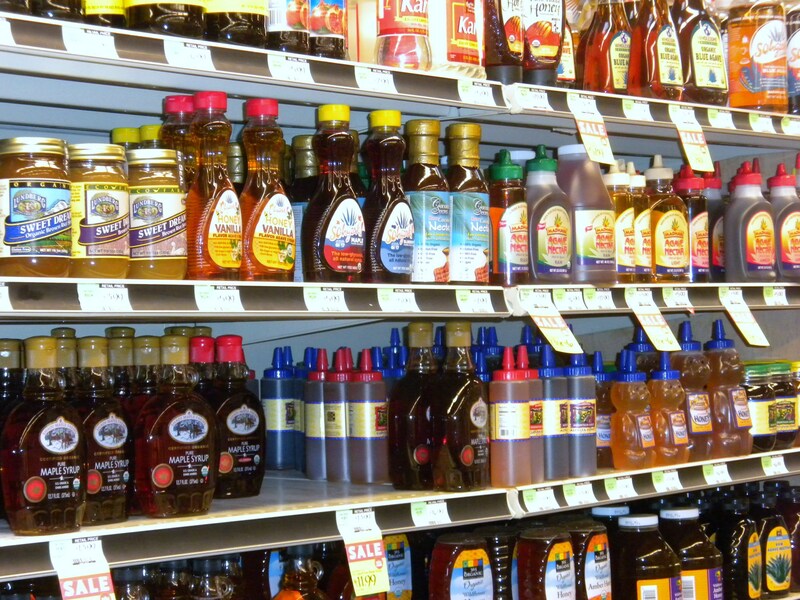 The problem I have with honey is that it still consists of glucose and fructose just like table sugar. However it has some other benefits and because it is so very sweet, you can use a lot less of it than you would sugar. So maybe it is a good gradient choice if your system can tolerate honey. I prefer not to use honey and instead I use whole grain sweeteners that have been naturally fermented. I use organic barley malt and I use organic brown rice syrup. I use these because they are not simple sugars and therefore do not rapidly spike your blood sugar level but instead they burn more slowly. A good analogy would be to think of building a fire. If you build a fire and used newspaper as fuel, it will burn up in a flash and then be gone. That is like eating sugar. It is a fast and furious fuel at first and then it’s gone, leaving the rest of your body in a state of chaos to keep up with the rapid change the sugar made. If you build a fire with good, aged hard wood, you can keep that going for hours as it burns at a slow, steady rate providing light and heat. That is like fueling your body with whole grains and whole grain sweeteners. They are what is called, complex carbohydrates and do not produce the rocky ups and downs that sugar does. This is made by putting barley malt into a heavy pan (cast iron works well) and heating it until it is bubbling like you would make a soft candy. By adding toasted oatmeal flakes and chopped nuts to it, and maybe a little whole wheat flour, you can get a nice mixture to put over sliced apples or other fruit. Bake it in a 350 degree oven for a few minutes and you’ve got yourself a nice apple crisp that won’t ruin your health. Mix the brown rice crispy cereal, raisins, peanuts and cinnamon in a bowl. Pour the brown rice syrup into a heavy saucepan or skillet and bring it to a boil. Simmer until the rice syrup is very bubbly and thick. Add the rice crispy cereal mix and quickly stir it all up so the cereal mixture is coated. Press the mixture into a 9X9 pan that is lightly oiled. Let it cool, cut it into squares and serve! When I make an apple pie, I drizzle a bit of brown rice syrup over my cut apples to sweeten them before baking the pie. I also use whole grain sweeteners for puddings, and to create a sweet and savory sauce for an entree. These are just some very simple, quick-to-make examples. The possibilities are endless and the best way to learn how to do it is by getting yourself a couple of great cookbooks. There are all kinds of fancy desserts without sugar. Let me know which ones you like best! This entry was posted in Cooking, Food, Health, Recipes and tagged barley malt, Blood sugar, Brown rice syrup, desserts, High-fructose corn syrup, honey, Sugar, whole grains by mycookinglifebypatty. Bookmark the permalink. Thank you Patty for this great article. I did not realize that grain syrups were a complex sugar. Very cool! I’m going to try your fruit crisp recipe. I feel SO much better and am much more emotionally stable when not consuming simple, refined sugar. Thanks again. Me too! I have been re-reading Sugar Blues and you wouldn’t believe the sordid history sugar has. I have a friend that bakes with Stevia. Do you happen to use Stevia, ever? I am not too familiar with it, other than it is in my protein powder. Thanks for posting this article. Hello! I do use stevia but only in very small quantities and not daily. It is highly processed but is a far better choice than the stuff in the pink, blue and yellow packets! Thanks for stopping by! I really enjoyed your post! I am trying hard to decrease the amount of sugars in our diet too. I understand that dried fruits, especially raisins, are good sweeteners. I have heard that if you add a few raisins to a tomato sauce that is too acidic it will help cut the acid and make the sauce more balanced…you can remove them later. Have you tried using dried fruits as sweeteners? I think using fruit is a great way to cut down on sugar. I haven’t tried dried fruit in tomato sauce, but I bet it tastes good to make it like that! Dried fruit is very concentrated and still has a lot of sugar (even though it’s naturally occurring). But it is a great idea for making a transition away from sugar especially when you’ve got to convince your family. Thanks for stopping by! Thanks for this article! It was really needed. My family consumes sugar in moderate amounts even in beverages like tea. Is brown sugar a better alternative to white sugar for everyday use? Why or why not? Thankyou! It would be great if you could send me a link. No problem! I emailed you the link. Yay Patty!!! Look at all these folks turning their backs on sugar! “All the ‘ose’s…” Good one. Thanks Little Sis! Yes, this blog got the most response of any I have written so far. I didn’t know there were so many that would agree! Thanks for taking the time to comment. You had me until the rice. LOL Quite informative, but as a low-carber, the rice did me in on the spot. Have you tried Lo Han? Little known fact about Honey and refined Sugar. In ye olde days diabetic ulcers were packed with refined sugar or honey – which killed the bacteria and allowed the ulcers to heal. Do we really want to put that in our bodies? Hi there! I totally understand your concern about the rice. I’m planning to address the whole low carb subject in the near future. Have never heard of Lo Han but I’ll check it out. Thanks for coming by to “see” me! You’re welcome! And now I’ve taken a little “walk” over to your blog! This is a great post. I need to start using more brown rice syrup. Vegan sugar! Who would have thunk? I like brown rice syrup a lot, so mild, wish it was a tad bit less expensive. Fortunately–or unfortunately–I have been using honey from South Korea for more than a year, as Christopher’s new in-laws gifted us with good organic honey as a welcome gift. And ginseng tea. I’ve been stretching it out, using very little. It feels like it’s a spiritual gift as much or more than sugar..feeding the spirit with in-law love. This is a lovely blog, Patty, one that many should be reading. I’m glad you enjoyed the blog, Kathy, and glad you have time to read it with all you are busy doing at the moment! I think if you’re gong to eat honey, a good organic one is best and like you said, eaten in small quantities. And you’re right – “in-law love” is good! Thanks for taking the time to comment. This blog inspired more comments than any other I’ve posted! I am closer and closer to leaving the sugar completely behind. I never thought I would say that but as I am a bit older I sense what it does to me and how much I like the way I feel without it. I will read it for sure and thank you! Thank you so much Karista! You are singing my tune on this post! Thank you for pointing out that sugar is sugar – be it maple, honey, brown, agave, white, etc. Our bodies more or less react in the same way to its effects. Having said that…I am not without sugar sin :-). I try to use it sparingly and shun white sugar completely (for the whole food reasoning you mention here). And where it makes sense to do so, I employ stevia either in liquid, powder or crystallized form – since it does not wreak havoc with our systems (well, I suppose it’s as yet unproven what ill effects it may have – egads!). Excellent post! So you agree that sugar is evil too? My friend really likes the sugar alternative xylitol. Have you tried that before? I’ve recently tried it in her pancakes and muffins and I really like the taste. Hmmm. I haven’t tried xylitol or even looked into it although I know it is added to “sugar-free” gum and toothpaste because it is not supposed to contribute to tooth decay and apparently doesn’t spike blood sugar levels. Taking the whole foods approach as I usually do, is probably why I haven’t considered xylitol. But if I did use it, since it is highly processed, I would use it in minimal quanity and not as an every day thing. Thanks so much for the re-blog! Let’s get the word out about sugar. Wow! Thanks so much for reblogging this! It was a great and very informative article! Thank you for sharing this with all of us.